BELDI COUNTRY CLUB, relax in a quiet and wonderful ambient. 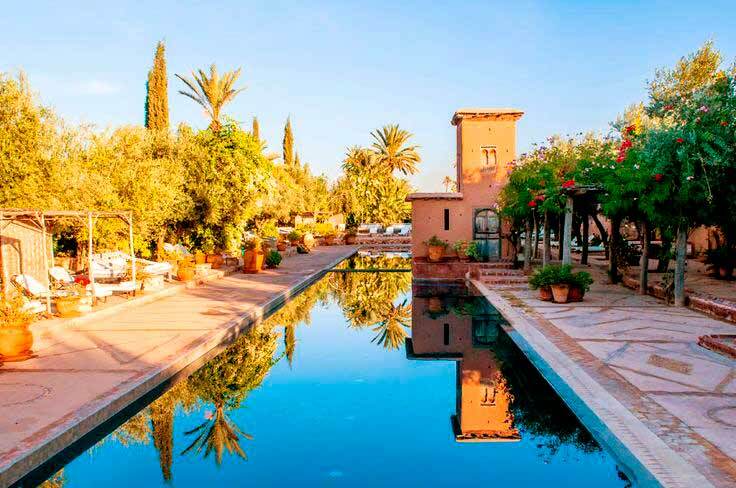 When a tourist is more than three days in Marrakech need a relaxing time. Beldi Country Club is the perfect place if you are looking for a quiet and nice place (if you do not mind the price). This is the club for non hotel residents in the grounds of the Beldi Hotel. The club is excellent having a very large pool for adults and 2 smaller for children, plenty of space in beautiful gardens with a very good restaurant, where a three course meal comes with the entry price. In our 7 days in a riad in the Medina we came here 3 days as it is so pleasant and well run. The spa was also very good. We (my wife and young daughter) spent 4 days at the Beldi Country club. From the awesome gardens and space to the food and the rooms, everything was just perfect. The service is excellent. We had breakfast, lunch and dinner there and it is nice to have home made local food either made or produce within the resort or nearby. There are loads of great things but the one that really made the trip worth is the heated swimming pool decorate with a cheminee wood log fire. This was one of the most amazing places! It is a little paradise in itself. The service was impeccable…and the restaurant, spa and staff were just incredible. My partner and I will most certainly be coming back here again. We were even contemplating having our wedding here. That’s how perfect it was. KM6 route du Barrage,BP 210,Marrakech 40000, Morocco. Near Airport area, you need take a taxi.